Why would a mainstream political figure publicly invoke Dr Abdus Salam’s name in the Pakistan of 2016? This is not the question that arose when we learnt last week about the prime minister’s stated intention to move a summary in which he would that the National Center for Physics located at Quaid-e-Azam University be named in honour of Pakistan’s only Nobel Prize winner in the sciences. Instead of such a salty question, the announcement was welcomed with great warmth and fanfare by a segment of Pakistani opinion broadly categorised as ‘liberal’. There were some salty reactions, no doubt, by those that were not altogether enthused by the press release from the PM Office on this matter. For the most part, it was easy to ignore that saltiness – vapid and absent as it tends to be of any rigorous or serious opposition. So perhaps we should just try to enjoy this great moment in our unmistakable journey toward becoming a liberal democratic republic? And if not that, at least we can celebrate the conversion of Prime Minister Sharif to a man who believes in liberal values? 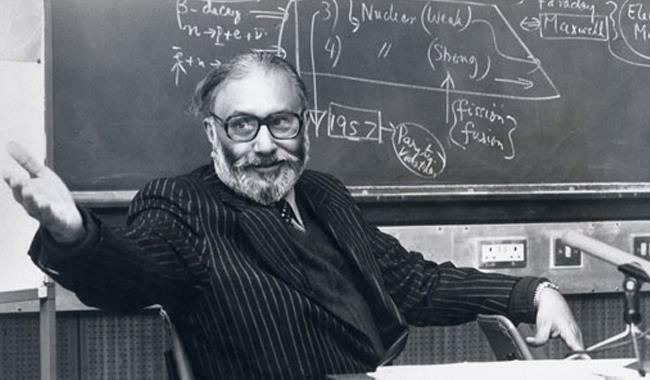 And if not that, at least we can acknowledge that Dr Abdus Salam is long overdue the recognition that he deserved in his home country – so at least that’s something. Right? Not quite. On Monday evening, as the nation observed the 12th of Rabiul Awwal, an Ahmadi place of worship was surrounded by a mob of hundreds, and confusion reigned supreme. The situation was defused when police and local administration intervened. Had this been ten years earlier, the pictures in the papers the next day would have been of rubble, and perhaps funerals. That no mass casualties took place, and that the place of worship is still intact, is thanks in no small part to the speed with which governments now tend to respond to outrages of this nature. The chief minister of Punjab is particularly responsive to these kinds of stories, and a more tragic outcome was avoided. At least for now. Ahmadi lives, Ahmadi property and businesses and Ahmadi places of worship are not unaccustomed to vulnerability. Not only has our state structurally integrated institutional discrimination against followers of this faith, our society too exhibits a fair bit of discrimination. In the context of the specifics of the Chakwal siege, and the general environment of rejection that the Ahmadiyya must contend with, one must ask serious questions about the degree to which a celebration of the symbolism of a building bearing the name of Dr Abdus Salam is merited. But let’s pause for a moment before we do that. What were the driving motivations or core purposes of Salam’s life? It is an interesting question. A man’s (or woman’s) faith is of course, an integral part of what shapes him (or her). So the fact that he was an Ahmadi is certainly not something one can dismiss altogether. But the judgement about what drove a man and his life’s work must be based on the evidence of that life. The evidence from Salam’s life is reasonably uncontested. Salam’s life was dedicated to science and to promoting science in Pakistan. His personal faith may have played a role in both his obsession with scientific inquiry, and his obsessive love for his country – but from the vantage point of a non-Ahmadi, it is unclear to me how his religion gets in the way of his adoration of science, or his love for Pakistan. The Prime Minister’s Office is engaged in an admirable long-term effort to project the face of a fresh new Pakistan. The screening of Sharmeen Obaid Chinoy’s Oscar-winning documentary, ‘A Girl in the River’, was one such instance. The prime minister’s celebration of Diwali with Pakistani Hindus last year was another. On a series of issues, the PM Office has tried to find the right balance between its electoral and constituency compulsions, and the demands of projecting a forward-looking, progressive mindset. It is an incredibly difficult balance to achieve. I fear, however, that in the effort to create the impression of progressive, open-minded and liberal values, this government risks exposing the shallowness of our national discourse, and its lack of preparedness to help change it. As ‘A Girl in the River’ showed, the challenge of honour killings is a multifaceted one. Saving a woman’s life requires a range of instruments of both state and society to work harmoniously and effectively: from emergency medical services, to psychological counselling, to legal aid and the courts’ system, to prisons and police, to family units themselves, and perhaps most of all, to young couples. In this manner, it is not difficult to see even successful legislation to prevent honour killings as being a small step in the right direction, but hardly a solution to the core problem. Since the Oscar win, and the plaudits that the PM Office won (quite rightly) for taking a position on the issue, can we honestly claim major progress on changing the status quo? Diwali celebrations in Sindh are another good example of this problem of symbolic satiation. Step 1: PM Sharif or PPP Chairperson Bilawal Bhutto Zardari attend a Hindu ceremony. Step 2: We all revel in the glory of our diversity, and the warmth of this diversity finding the audience of VIPs in this country. Step 3: We use various means of expression to spread the warmth. Step 4: We quickly move on to the next thing. Meanwhile, Hindus in Pakistan have real issues. A symbolic participation of the highest office in the land is great. But like minorities in many countries, Hindus in Pakistan face serious barriers to their ability to fulfil their potential: individually, and as a community. What specific steps have been taken to address those, since the widely feted prime ministerial attendance of Diwali last year? Dr Abdus Salam is a Pakistani hero, whether buildings are named after him or not. More importantly, his life’s work was science and its promotion. A plaque on a building and five scholarships in his name do not solve Pakistan’s urgent education crisis. They may, however, inflame the easily provoked reactionaries for whom other people’s faith is a matter of life and death. The PM Office and the tiny enclave of liberal thought in Pakistan may own nice watches, but those reactionaries have all the time in the world. They have the social and economic capacity to take on the state and win. They have demonstrated this capacity consistently over the course of the last 60 years. The question we must ask ourselves is this: does the symbolic gesture of naming a building after Dr Abdus Salam solve either of the two problems that we may imagine deserve being solved? First, does it help improve science in Pakistan, at either the primary, middle, secondary or tertiary levels of education? Does it help make Pakistan more secure (as Abdus Salam worked to make it)? And second, does it improve the lives of Ahmadis in Pakistan (as so many liberals in this country sincerely want it to)? The only people that are falling for these gimmicks and this symbolism are the very people that need to be vigilant about extracting real results from our democracy. Meanwhile, tensions in Chakwal remain high. Should we really be patting ourselves on the back for renaming a building whilst other buildings are vulnerable to being overrun?